Would you like to try indoor vegetable gardening? I started growing food indoors years ago and have lots of favourites like leafy salad greens, peas, herbs, microgreens, and more. 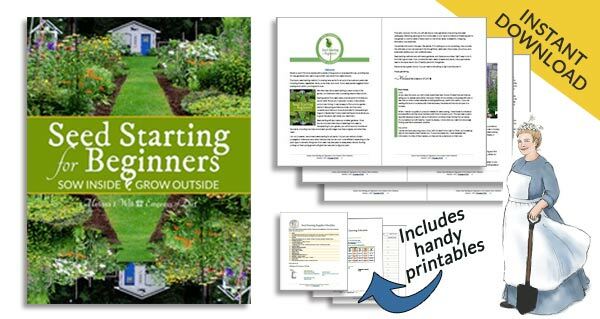 I’ll show you everything you need to get started to have your own low-cost, easy kitchen garden right inside your home. My adventures in indoor food growing started years ago and I have been trying out new veggie seeds each year ever since. I love indoor gardening during the winter months, and it’s pretty cool to be able to grow your own salad greens for dinner right in your kitchen. Growing veggies in your home is not expensive and it will only take up as much room as you allow it. One tray of salads greens can easily fit on a 3-foot shelf with some basic fluorescent lights hanging above it. To be realistic, do not expect to harvest volumes of food like you can from an outdoor veggie patch. Indoor vegetable gardening is more like a hybrid between veggie gardening and caring for houseplants. It’s as much about the joy of growing things and anything fresh and edible is a bonus. You’ll definitely be eating lots of greens, but those elusive indoor tomatoes will take time and patience. 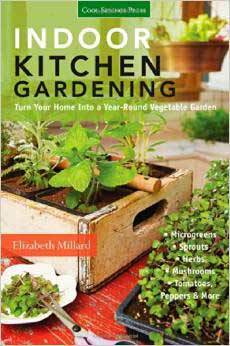 This lists all of tips on growing vegetables, herbs, and few other things like avocado and pineapple plants indoors. I include them not because you’re likely to get fruit from them, but they are another fun project that will develop your indoor growing skills. After years of experimenting with a whole bunch of different veggies and herbs, I have found that certain ones do well each time, and some are very easy to grow, providing real food to put on the table. This tells you how I grow veggies indoors year-round, and which ones I recommend growing. Microgreens are simply the edible seedlings of herbs and vegetables, planted in growing medium. They’re little so they’re fast to grow! Find out How to Grow Microgreens Indoors along with some recipes to try. This is my favourite. It is very easy to Grow Salad Greens Indoors under simple lights and have your harvest ready in just 4 to 6 weeks. This isn’t heads of lettuce or hydroponic gardening, but just seeds in growing medium that produces all sorts of delicious baby spinach, arugula, mustard, and more. Most herbs are full-sun lovers and grow best outdoors, but there are definitely ways to successfully grow them indoors as well. This guide shows How to Grow Herbs Indoors and lists annual and perennial herbs that can switch between indoor and outdoor growing. This was my first and best surprise in indoor kitchen gardening. I started some pea seeds indoors for fun, and they actually flowered and produced pods with peas. Until then I had no idea this was even possible. How to Grow Peas Indoors shares everything you need to get started. It is very unlikely you’ll get an avocado you can eat from this, but it is fun to Grow an Avocado from Seed to create a new houseplant. The method I use does not involve toothpicks or water, and it ensures that you only plant a viable stone. I love trying to grow all the natural foods we get from the grocery store. How to Grow a Pineapple shows how to take the top of a pineapple and root it and grow it on as a houseplant. Some people claim theirs have fruited after many years, but I’ve never kept one long enough to find out. No matter, it’s still a fun thing to grow. You are not likely to get fruit, but you can definintely grow a houseplant from a store-bought mango using these instructions. Whether I plan to grow something outdoors or indoors, I use the same seed starting method each time. Seed Starting for Beginners is a simple, low-cost way to starts plants from seed, sharing everything you’ll need including lights and more. I promise, it’s low-cost! 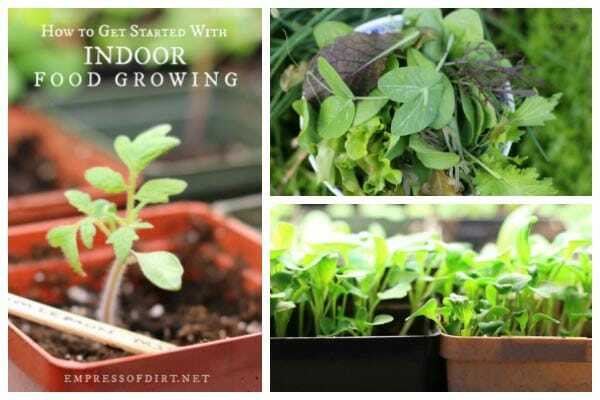 There are also some tips to fast track this here: How to Get Started with Indoor Food Growing. 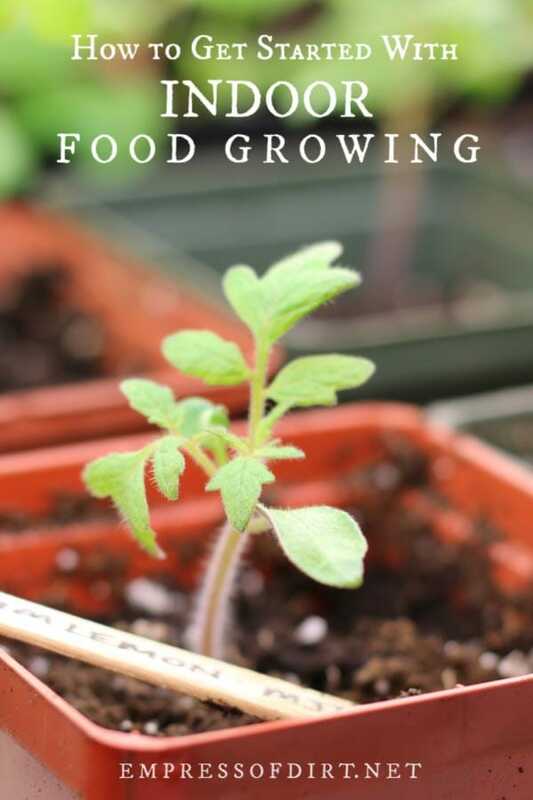 If you just want to know what I use as grow lights, Best Low-Cost Seed Starting Supplies shares everything I use for all indoor seed starting as well as growing veggies and herbs indoors. It is my best grow setup for indoors and works like a charm. If you want step-by-step instructions, these will help. 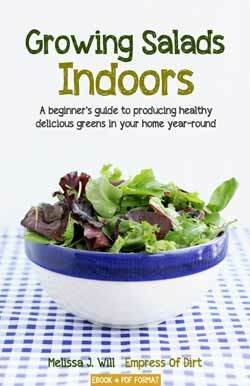 Growing Salads Indoors: A beginner’s guide to producing healthy delicious greens in your home year-round. Excellent way to get started. Indoor Kitchen Gardening: Turn your home into a year-round vegetable garden. Great for anyone ready to grow a variety of veggies indoors. I hope this will inspire you to try growing veggies or herbs indoors. Or even an avocado! I especially love doing this during the winter months when I need that love-of-all-things-gardening feeling to keep my spirits up. I,have floor to ceiling windows the entire south side of my house so I put tomatoes, peppers, ginger, turmeric in large pots on the deck each year. In winter I bring them inside. This year I have a volunteer grape tomato and average 1 or 2 dozen each week. since I am only one person, this is great for my salads every day. Peppers are not as prolific, but give enough for me. Next year I am adding romaine lettuce, sweet onions. I get organic eggs from a neighbor. I also add “Moon Drop grapes”.. makes a great salad. What do you do about the little fruit flies in the house and your winter veggies? And, what doy ou do about getting mold on the tops of the soil? I don’t over water- the plants are dry.and begging for water..but the top of the soil has white “mold”…..
Hi Chris, I only get fruit flies with harvested fruit, not anything I’m growing in the house. And for that I use a homemade vinegar trap (just vinegar in a cup with a cover and some fine holes so they can get in but not out). As for your growing medium issue, you might want to try running a fan next to your plants. I keep one attached to the timer that runs the lights. I have not had the white mold you describe. There’s a lot of possible causes. Starting with clean containers (bleached) and new sterile growing medium are essential too.